Solico has a diverse collection of lighting for any and every application that you might have. Looking for something specific? Type in the part number to check what we have in stock. 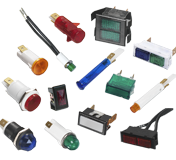 Sorenson Lighted Controls offers a wide variety of lighting solutions. To search for available SOLICO inventory please select the button below to go to ECIAauthorized, where our Franchised Distributors inventory is listed.